It is a privilege to be able to make paintings for a living. Making a living. Making to live, living to make, it has all become the same to me now. How many people can wake up in the morning, listen to a news story, and say, “Until I change my mind, which may be in five minutes or five years, I am going to devote my work to that story because I think it is interesting!” I stoop to pet an old pooch and the next thing I know, that pooch occupies my every working moment. This is such intoxicating freedom that we understand why so many folks we meet say they want to be artists, too! Before we all met the new and improved and slightly adorable Pope, the news was littered by stories about child abusing priests. 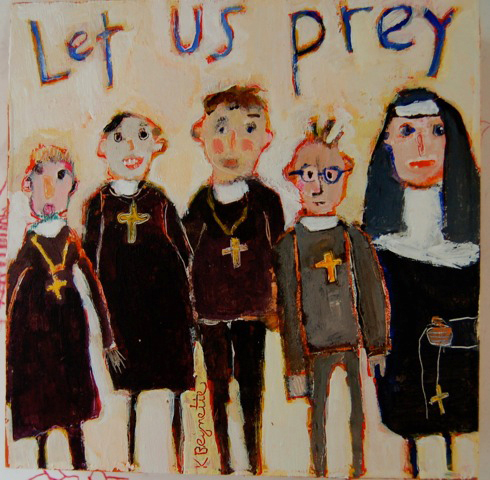 Those stories inspired a series of paintings called “Let Us Prey” and a song I wrote, “Mother’s Day.” Painted with great passion, they were received with great passion. I painted them until I had said everything I had to say about the subject. One day, a woman came to my studio in a wheelchair pushed by her caregiver. The woman was quite elderly and very, very ill. The caregiver was dragging a poor little Boston Terrier on a leash. She turned to the dog and snarled, “Come on, Jellybean!” The whole encounter was over in less than three minutes, but that was time enough to break a little piece of my heart. I decided to virtually adopt Jellybean and give him a new life as MY pet in fifteen paintings. 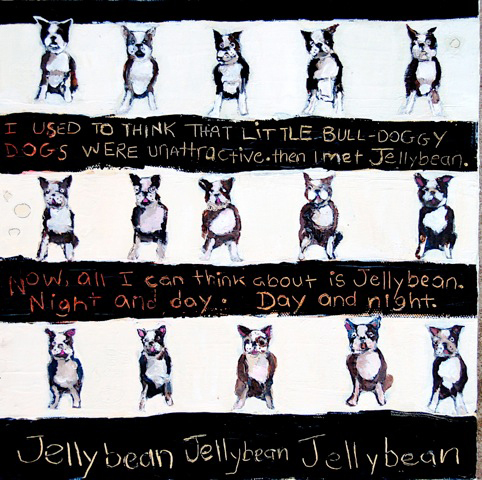 I own only one painting from my career as a professional artist and it is the first painting I made about Jellybean. I kept it because it marked a turning point for me. I was shy about exposing my feelings in such an innocent way, but Jellybean gave me confidence and the knowledge that THIS is the way I work.